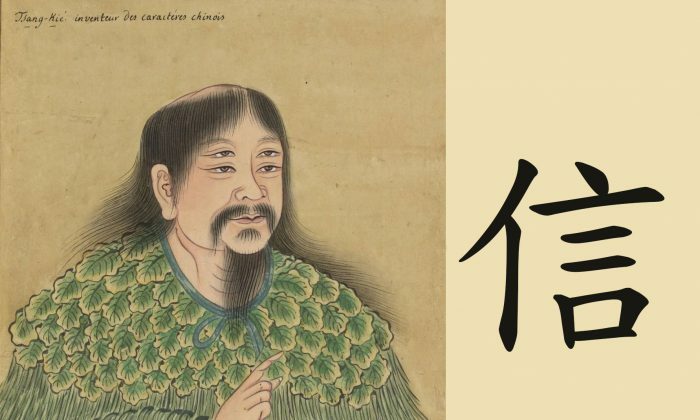 When used as a noun, 信 (xin) refers to a written communication, letter, message or information. When used as a verb, it means to trust, believe, have faith or confidence in a person, idea or thing. The component on the left side of 信 is the radical亻, a compressed form of the character 人 (ren), man. On the right side is 言 (yan), referring to a word or language. Thus, a man plus a word represents trust and belief. Does this logic seem naïve to people of this modern age? Actually, this is embodied in the English motto “A man’s word is his bond,” where ‘bond’ goes beyond the idea of a money agreement to mean duty, obligation, promise or contract. By itself 言 (yan), meaning language, is a full character. The Oracle Bone Script character for language is on the left and the modern day full Chinese character is on the right. The lower part of 言 is the character 口 (kou), meaning mouth; above the mouth, is a leaf curled up as a whistle or flute. Hence language is the sound from the mouth of a man. What a romantic yet logically good design. This 言 is widely used as a radical in many characters, such as 誠信 integrity, 許諾 promise, 誓言 pledge, 辯護 defend, 謝謝 thanks, 請 please, 讀 read, 談話 talk, 討論 discussion, 讚 praise, 說謊 lie, 詩詞 poetry… Thus, even at a glance, we know that the character relates to man’s words. In the simplified version used in Mainland China, when used as a radical on left or middle of a compound character, 言, is reduced to 讠, just a meaningless sign!